Single cask whisky matured in a first fill bourbon cask. Nose: Smooth and sweet flavour of vanilla, praline chocolate and nuts. Taste: Warm and spicy, with prominent vanilla, butter and sweet honey. A subtle influence of oak. In cooperation with whiskyshop Dram 242, Braeckman Distillery introduced a whisky. 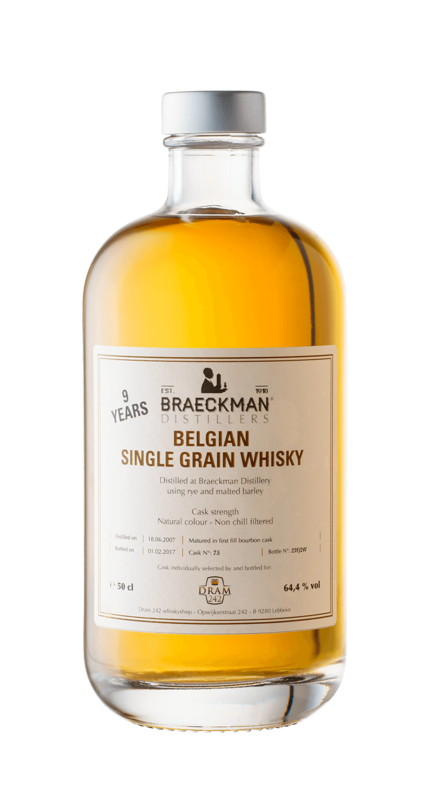 This 9 years old Belgian Single Grain Whisky solely consists of rye and malted barley. It is a single cask whisky bottled at cask strength. Therefore only 241 bottles are available. The grain distillate matured for 9 years in American first fill Bourbon barrels. That's why our whisky has its natural gold colour, refined quality and hints of vanilla.